Training and seminars are significant for an individual especially if the aim is to acquire new knowledge and abilities. With this, organizations, institutions, as well as employment companies conduct varying activities for the people involved in running their management towards success. Workshops are another sort of activity which may be done on a quarterly and annual basis. Compared to a training, a workshop normally requires the participants or attendees to form groups for an activity and this usually ends in a day, while a training will take up months. A workshop will also demand a range of documents to obtain the goals and objectives of the event such as a workshop evaluation form which can be presented before and after the workshop and a workshop registration form which will highlight the names and identification of the participants. What Is a Professional Development Workshop? A professional development workshop focuses on providing a session for meeting the professional needs of a participant. This workshop deals with formal education which is centered on helping teachers, doctors, as well as all other people who are working as professionals to acquire better knowledge and skills of their subject areas, and improve their competencies to effectively promote a well-rounded professional background. This type of workshop will need a specific form for a successful registration process which is a professional development workshop registration form. This form which contains questions about the prospective participants’ general information and their educational achievements will be given for them to fill out in order to inform the organizers of what sort of people will they be dealing and come up with activities related to them. 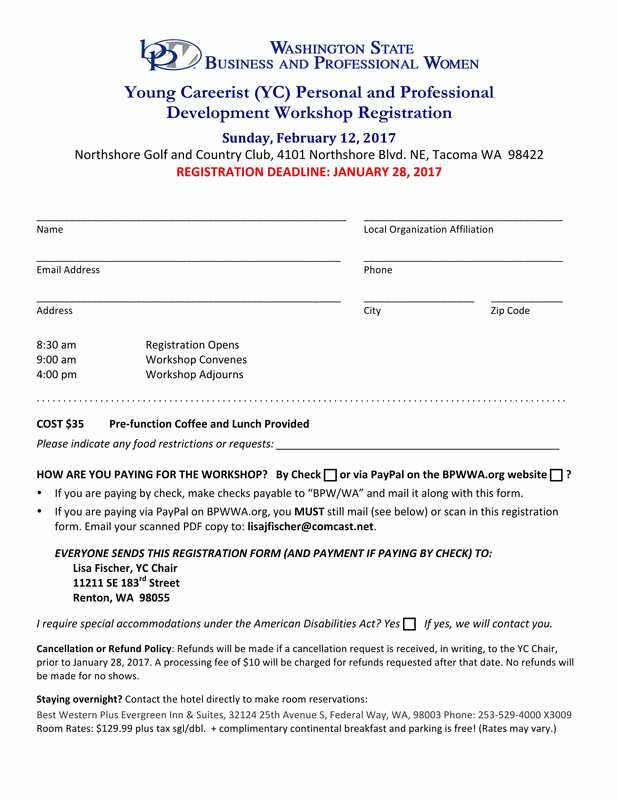 Why Is a Professional Development Workshop Registration Form Important? The importance of having a professional development workshop registration form is to assure that the workshop session and all the activities involved in the workshop is related to the varying participants. The form will also aid in promoting an easier way of listing the names of the participants for their certificates and recording purposes. Without this registration form, the organizers of the workshop will be facing trouble in pointing who among the people in the area will be under their accountability when an accident happens. The form does not only help the organizers but also the participants since it allows the registered participants to either have a reserved seat and dining, or be fully engaged in the relativity of the workshop. Disability Professional Development Workshop Registration – If the objective of a workshop will be targeting those teachers who deal with children with special needs, then they will have to create and produce a disability professional development workshop registration form. This will have the name, email address, contact information, and the participant’s set of skills which he may use or share in the workshop. 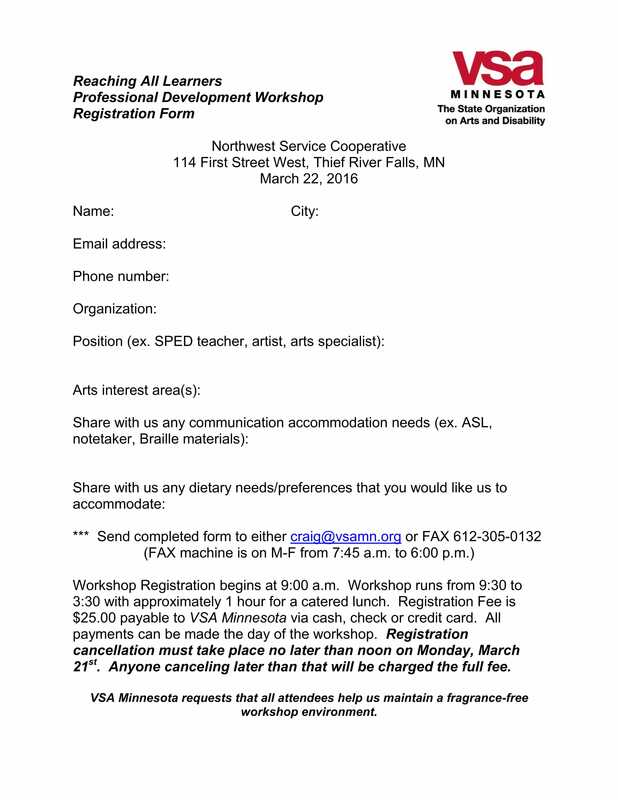 A supply request can also be included in the form to inform the organizers that some materials such as Braille materials and note-takers may be needed for the workshop. Ecology Professional Development Workshop Registration – Ecologists have been in demand nowadays which then requires them to undergo a variety of training and workshop to meet the needs of ecological sciences companies. 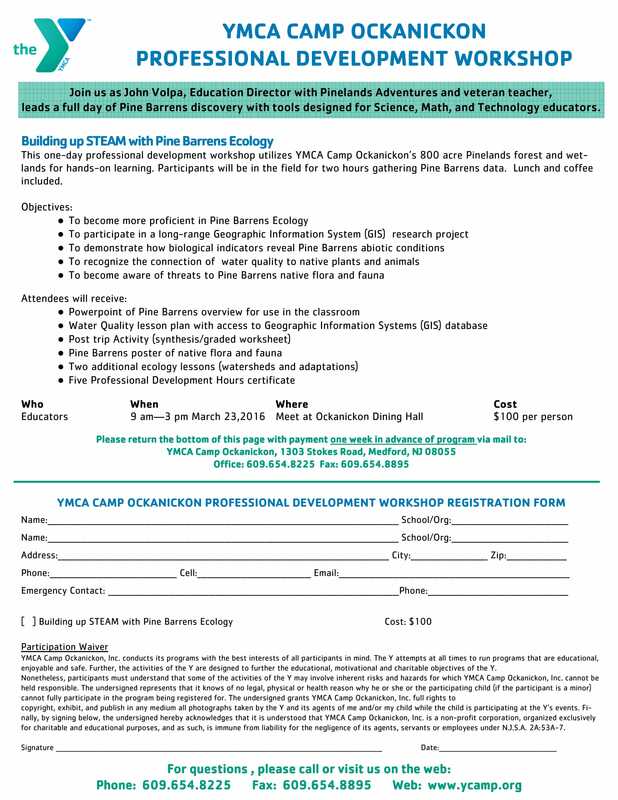 With this, an ecology professional development workshop registration form will be used to state the rules and what activities will be expected in the workshop. The list of materials that the participants will receive should also be included in the form. Since some workshops who cater the learning and training for ecologists will surely be handling matters of the environment, an emergency contact is necessary for maintaining safety and security for all involved people. The stated contact person should be called for a trial to serve an assurance that the number is available and that the written identity of the contact person is not a fraud. 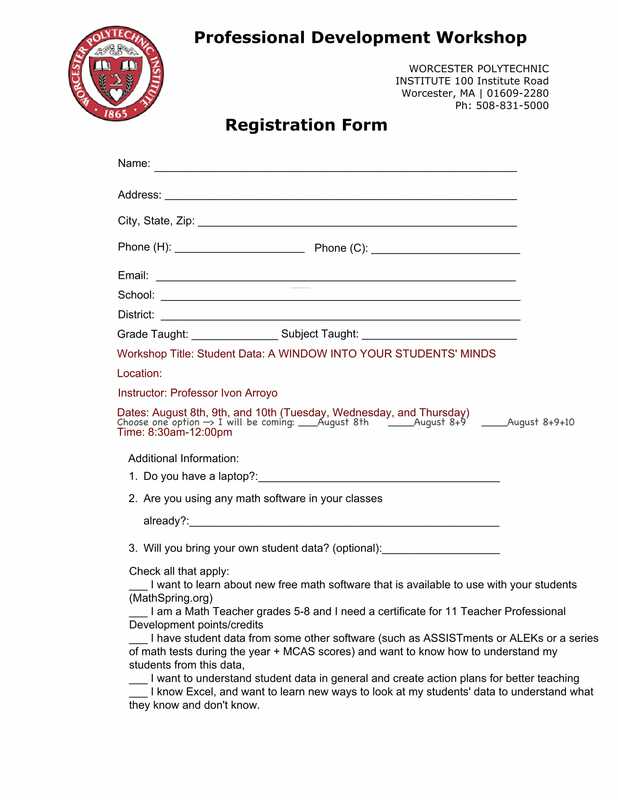 Math Professional Development Workshop Registration – Math professors and problem solvers are the kinds of people who easily eat numbers and teach them to other individuals. These people are the main target users of a math professional development workshop registration form which will contain the details of the workshop and their personal information. Some organizers of the math development workshop also allow their participants to engage more in the workshop by letting them share the strategies they know, and give activities to strengthen the capacities of the mathematical mind. Strategic learning and collaborations are vital in this workshop. Medical Professional Development Workshop Registration – Getting into the medical field as a professional individual is not an easy task for anyone. This is due to the reason that there are numerous registration processes to undergo before acquiring a particular degree which will be accepted in the field. A nursing registration procedure will be needed for those who aim to be a nurse while other processes will be for doctors, surgeons, as well as the medical staff. 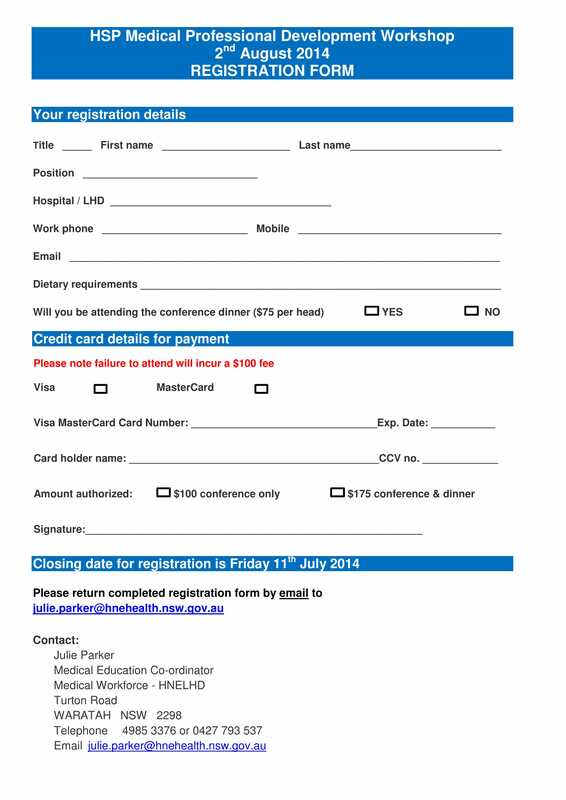 Since there are many jobs in this field, a medical professional development workshop registration form must be able to cater the specific professionals even in various job positions. This is why a list of topics or the schedule of the workshop should be included or attached to the form for the participants to know when they must attend and what they will be enhancing. Personal Professional Development Workshop Registration – Compared to the aforementioned professional development workshop registration forms, this document will indicate other personal details of a participant such as food restrictions or any preference to cater his or her satisfaction. Refund policies and payments needed for each participant will serve as a contract agreement which obligates the participant to follow the terms set out by the organization and to agree on what needs to be paid for the workshop. These examples are just some of the few professional development workshop registration forms which can be used by any organization who will conduct a workshop. However, a simple and general registration form can also be produced in place of an intricately plotted professional development workshop registration form, as long as it meets the needs of the organization and it highlights the capacities as well as the identity of the participant.